Hi everyone I'm Jack Red, today it is time to go back to a simple time in my life. During my child hood, one of my favorite things was wrestling. I used to watch a lot of WWF now WWE back in the day. Back then they had a lot of great games on several consoles. Good news is both of these are two of their finest among their respective consoles. We're going Wrestlemania this time around where I put Wrestlemania 2000 on Nintendo 64 against Wrestlemania the Arcade Game on PlayStation. Wrestlemania 2000 is easily one of the absolute best wrestling games I have ever played. You can play up to four players in several modes. You can live out some of your wrestling fantasies at the time. 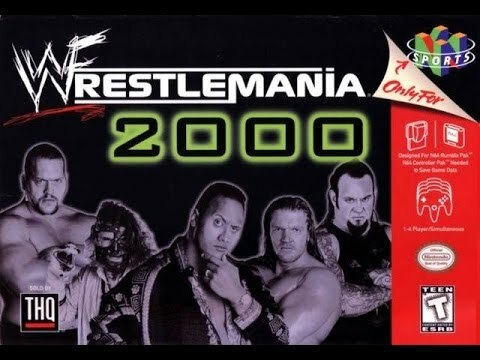 Wrestlemania 2000 was made by the same behind the best N64 wrestling games including some WCW games. Wrestlemania the Arcade Game is ported to several consoles. I actually did own three versions of it including PlayStation version. Midway Games was allowed to make a few WWF games for a short time. This took parts of Mortal Kombat 3's mechanic for an unique wrestling game experience. This is one of the best ports you can find. Now this is a true Wrestlemania main event worth every minute & money. I got to be honest both of them are great for their time. Both of them are the truest form of what Wrestlemania stands for. Both has great controls with easy to do signature moves. This is a lot tougher than it looks. Music wise I have to give the edge to Wrestlemania the Arcade Game. Roster wise both Wrestlemania games did an amazing job what they had. Yes there's a lot more characters in Wrestlemania 2000. But I felt they stand out more due to having moves only they can do. In Wrestlemania 2000, you have a few ways you can win. Of course it depends on which match or the rules. You have to pin your opponent in Wrestlemania the Arcade Game. In Wrestlemania 2000, the story plays out differently for every character. By defeating particular characters you can unlock them as playable characters. There's no hidden characters in Wrestlemania the Arcade Game. You can fight up the entire roster in the second, harder campaign. There's more to do outside the ring in Wrestlemania 2000. You can change outfits & create your own characters. Cheating is still better in Wrestlemania the Arcade Game. Audio wise in sound effects is very close. You get more match options in Wrestlemania 2000. The real deciding factor for me is the difficulty. Wrestlemania the Arcade Game's difficulty does spike up. Your opponents could own you fast if you aren't ready. Sometimes among pinning them, they are given a small amount of health. Similar to performing Mercy in most versions of MK3. The big match itself will truly test how difficult this game will get. As stated before you have to take on every character in one long match. Similar to the final level of Primal Rage. In Wrestlemania 2000, you can defeat the champions in those final matches. The AI in general is better in Wrestlemania 2000. I am considering a lot for just this particular face off. I will confess before writing I didn't know which one I would pick. Wrestlemania the Arcade Game has great original songs. So does Wrestlemania 2000 but that also has real wrestler themes with their intros. This is easily one of the toughest I have ever done in this series. After much needed thought I have decided to go with Wrestlemania 2000. The campaigns plays out more like the actual shows. You get a lot more wrestlers to choose from as well as matches and rules to play with. It does have slightly easier controls. Wrestlemania 2000 also has wrestler intros with their theme songs. What sells the deal for me is creating your own characters. A huge step up from WWF War Zone. You get plenty of options to keep you making them for hours.